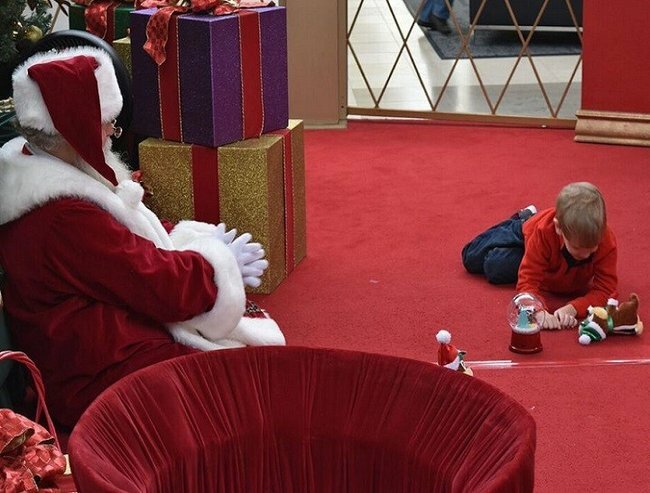 The Santa who went to great lengths to help a boy with autism. The Santa who went to great lengths to reach a little boy with autism. I don’t even bother trying to get my son to sit down for a Santa photo anymore. Not all kids like it, as we can tell from the countless Christmas photos featuring hysterical children trying to get off the lap of their local shopping centre Santa. As all mums of special needs children know, that hysteria isn’t worth the funny photo, because its not so easy to calm them down afterwards, not to mention the long term effects in terms of anxiety surrounding similarly confronting experiences. I gave up a few years ago. It just wasn’t worth it. Then I spotted a photo of a shopping centre Santa lying on the floor next to a boy. The Santa was carefully getting down on the little boy’s level, playing next to him, not pressuring him into doing anything and the boy was slowly but surely warming up and inching closer. Tears sprang into my eyes because, without even reading a word, I immediately knew what was happening. The little boy’s name is Brayden Deely. He’s just six and he has Autism Spectrum Disorder (ASD). 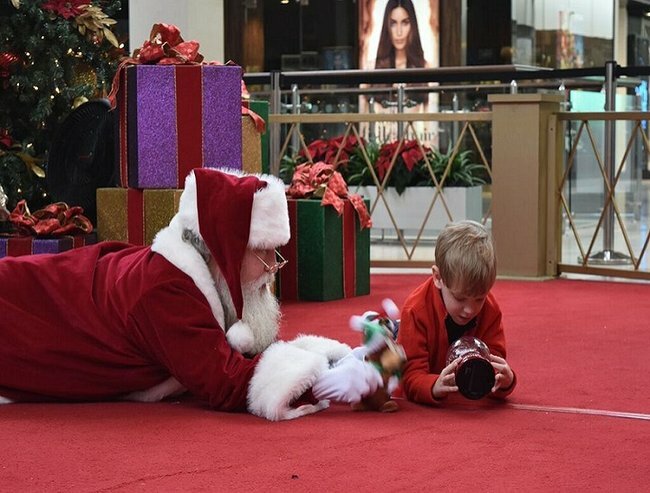 Mum Erin Deely wouldn’t normally consider taking Brayden to see Santa but she heard of a local Caring Santa event being hosted by Autism Speaks at North Carolina’s South Park shopping mall in the U.S.
Santa begins by placing toys on the floor next to Brayden. Photo provided by Erin Deely. Even though Brayden wanted to meet Santa, he was reluctant and Santa needed to take careful steps when approaching him. Erin said she wasn’t expecting to get any photos at all, and it wouldn’t have bothered her in the slightest. It was all about helping Brayden to experience Santa just like other kids. The photos she ended up with though, are beyond special. Santa carefully sits on the floor. Photo provided by Erin Deely. Autistic kids are right there in front of us all. They just need a more considered approach to make them light up with the joy that comes naturally for other children their age. 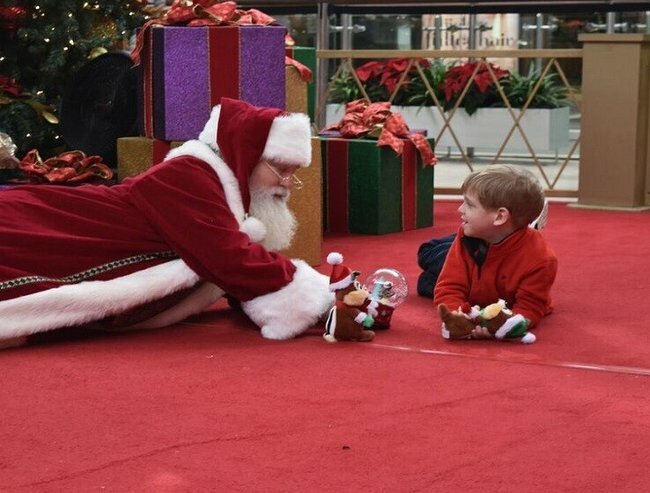 Most of the credit goes to Santa, whose careful choices made Brayden’s day. Erin says it took just a few minutes and a musical snow globe for Santa to make contact. Santa slowly inches forward and makes contact with Brayden. Photo provided by Erin Deely. The success of this event certainly makes the case for having more Caring Santa events and similar events have been organised for autistic kids in Australia. 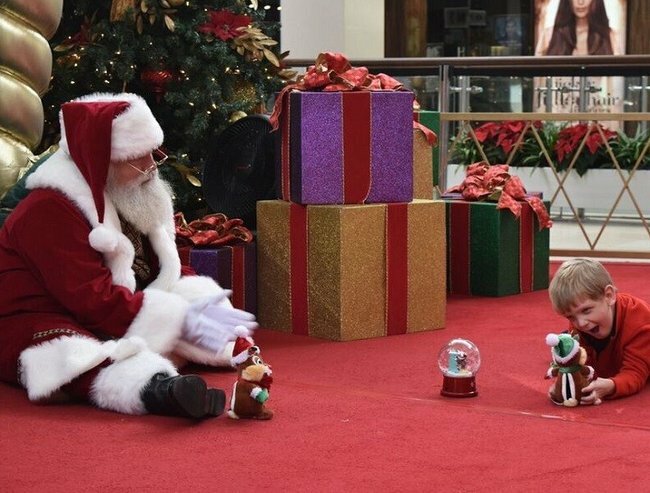 Sensory Santa has been developed by Mirvac shopping centres with the help of Chanelle Avison, who runs Sensory Movie Day, a not-for-profit organisation for families with special needs children. As well as Sensory Santa days and Sensory Movie Days, musical theatre shows such as The Lion King often go to the effort of catering to ASD kids, with the 2013 musical setting up a special adapted performance for children on the spectrum, complete with trained staff on hand, dedicated quiet areas as well as a modification of the actual performance to avoid any jarring noises or light displays. It was a huge success. 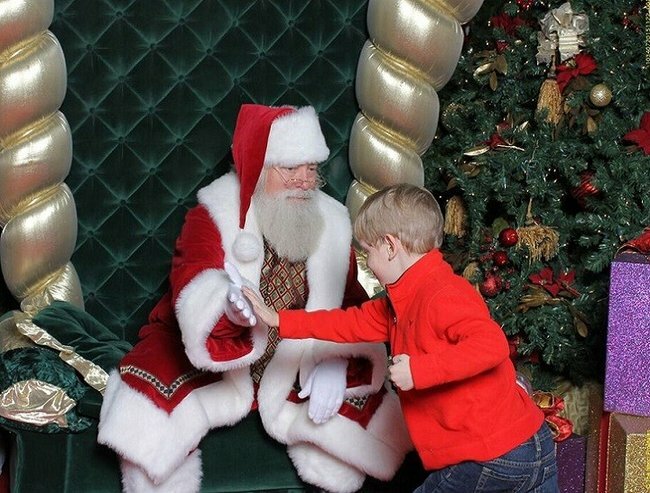 Santa gets a high five from a delighted Brayden. Photo provided by Erin Deely. When I asked my son Giovanni, seven, what he wants for Christmas this year he said, “I don’t know” so I certainly relate to that. When I mentioned fish – having read that pets are a great idea for children who are on the spectrum – his face lit up. Small, careful, considered steps are all it takes to reach out to our children who desperately want to participate in life but simply can’t cope with it all. They want to meet Santa, to open presents, to feast on Christmas lunch, to be hugged and go to parties and celebrations with their friends. When they get there though, it’s often just too much. We now know so much about how to reach them, and hats off to this brilliant shopping centre Santa who showed us all that it is possible to reach out to so many kids with special needs, and spread Christmas cheer to even the most reluctant of children.